Our range of products include Gas Sensor Transmitter suitable for All toxic, Combustible/explosive, Flammable, Oxygen Gases. The ATS-109TD Sensor/Transmitter with without Display operates on 24 VDC power and 4-20 mA output and optional alarm relay board. 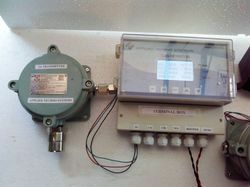 This sensor/transmitter can be connected to various applied controllers or computer-based instrumentation, such as PLC or similar instrumentation. The ATS-109TD Sensor/Transmitter operates on 24 VDC power and features LED alarm indicators, 4-20 mA output and optional alarm relay board. This sensor/transmitter can be connected to various applied controllers or computer-based instrumentation, such as PLC or similar instrumentation. 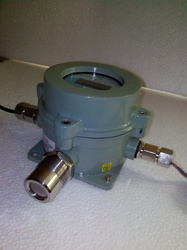 The Model ATS-109TD incorporates a pellistor or catalytic bead sensor. This sensor consists of a matched pair of elements, one active and the other for compensation. When in contact with a combustible hydrocarbon or solvent causes the gas or vapor to "burn" or oxidize at concentrations below the Lower Explosive Limit (LEL). This oxidization process raises the temperature of the active bead and increases the resistance of the internal wire coil. The second bead does not have the catalytic coating and provides compensation for environmental conditions including temperature and humidity. When these elements are connected to the circuit, a useable signal is produced that is proportional to the gas concentration . 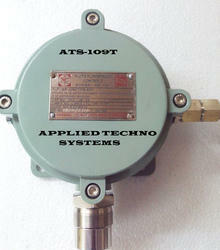 The Model ATS-109TD incorporates a pellistor or catalytic bead sensor. This sensor consists of a matched pair of elements, one active and the other for compensation. When in contact with a combustible hydrocarbon or solvent causes the gas or vapor to "burn" or oxidize at concentrations below the Lower Explosive Limit (LEL). This oxidization process raises the temperature of the active bead and increases the resistance of the internal wire coil. The second bead does not have the catalytic coating and provides compensation for environmental conditions including temperature and humidity. When these elements are connected to the circuit, a useable signal is produced that is proportional to the gas concentration. We have marked a distinct and dynamic position in the market by providing a high quality array of Gas Sensor Transmitter. Our offered transmitter is availed in a variety of specifications to choose from. Provided transmitter is precisely manufactured at our highly advanced manufacturing unit following industry distinct guidelines. This transmitter can be connected to various applied controllers or computer-based instrumentation, such as PLC or similar instrumentation. The entire range can also be availed from us at the industry leading prices. The ATS-109TD Sensor/Transmitter operates on 24 VDC power and features LED alarm indicators, 4-20 mA output and optional alarm relay board. This sensor/transmitter can be connected to various applied controllers or computer-based instrumentation, such as PLC or similar instrumentation. The ATS-109TD Series Sensor/Transmitters utilize electrochemical type cells to detect the target gas. These cells consist of electrodes, electrolyte and an air/liquid separation barrier. 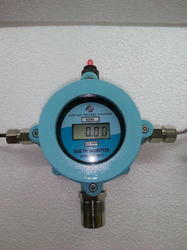 We are instrumental in offering a wide range of Gas Sensor. This sensor is manufactured using finest quality raw-material and superior technology. This sensor is suitable for Combustible gases (%LEL) or PPM level of CO, H2S, SO2, and NO, NO2, CL2, B2H6, Hydrocarbons, organic solvents and other Toxic Gases. In tune with diverse requirements of our copious clients, we modify the entire range in various specifications. Our offered range has gained exceptional value amongst our clients for its defined features. 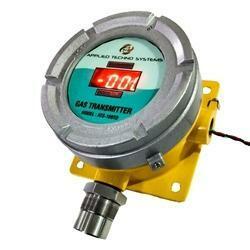 Model ATS-105M is Single Point Hazardous Gas Monitor/ Alarm for ambient air. Model ATS-105 is suitable for Combustible gases (%LEL) or PPM level of CO, H2S, SO2, NO, NO2, CL2, B2H6, Hydrocarbons, organic solvents and other Toxic Gases. The ATS-105M features a rugged, long-life Electrochemical, Catalytic Pellister, metal oxide semiconductor (MOS) sensor. The sensor is available either in a separate junction box for remote mounting up to several hundred Meters from the monitor, or as an integral component attached to the instrument. The ATS-105M provides a Graphics LCD display of gas concentrations, audio/visual alarms, relay contacts, plus analog (4-20mA ) and digital RS 232/485 and USB outputs. 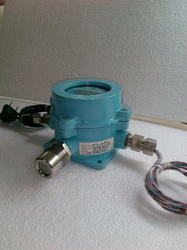 Accept Single 4-20 mA Input from Remote Sensor/Transmitter. 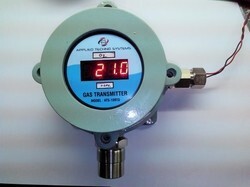 By keeping track with the market development, we are offering optimum quality Infrared Gas Transmitter. It can be calibrated for a specific gas, such as methane, but it also responds to some other hydrocarbon gases, including propane, butane, etc. Our offered transmitter is extensively appreciated by our esteemed clients for its precise design and high quality. 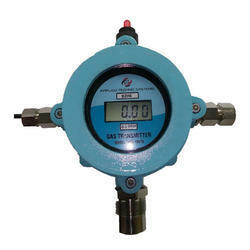 Provided transmitter can also be availed in various specifications. The transmitter offered by us is manufactured by a team of our skilful professionals utilizing quality tested components and advanced technology. The ATS-109TD Ammonia (NH3) Sensor/Transmitters utilize electrochemical type cells to detect the target gas. These cells consist of electrodes, electrolyte and an air/liquid separation barrier. Gas molecules enter the cell and, as a result of an oxidation/reduction reaction, generate an electrical current proportional to the gas concentration.